Jedediah Smith Redwoods State Park is known for its epic old-growth redwoods. But did you know about the park’s swimming beach located on Smith River? After a day spent hiking under the redwoods, it might be nice to cool down. Smith River is prime for fishing, kayaking, and snorkeling (with a wetsuit, since the water is usually cold). If you happen to be at the park early in the morning or at dusk, listen for a bird that goes “keer, keer” — it could be the elusive marbled murrelet. If your backyard swimming pool feels confined, try the swimming hole at Richardson Grove State Park — it’s huge (and deep)! The water is placid and a deep bluish-green — and it couldn’t be any more inviting. A pebbly bank lines one side of the water, creating a perfect spot for visitors to relax in the sun. If you’d rather wade ankle-deep instead of swim, walk south of the visitor center. There, you’ll find more shallow water. Many visitors bring tubes to float down the river, which is not a bad way to spend the day. 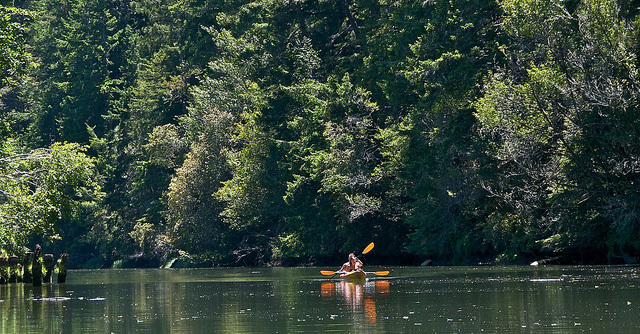 To better understand Navarro River Redwoods State Park, look at it on Google Maps. The park is shaped like a snake and follows the course of North Fork Navarro River. This, of course, makes it perfect for many aquatic activities. Fishing, canoeing, kayaking, and swimming — they’re all options. Here’s a League tip: Check out the swimming hole at milepost marker 3.66. For those who are less enthusiastic about getting in the water, the park is still a great place to go for a scenic drive and a picnic. Mendocino Headlands State Park is where primeval redwood forest and rugged California coastline meet. Not surprisingly, it’s a magical place. Visitors are welcome to wade or swim in the Big River — a respite from rugged ocean surf. Another alluring feature is the sea caves, which are embedded in the coastline and accessible by kayak. For anyone inclined to stay out of the water, several trails run along the bluff. No matter what activity you choose, spectacular views lie ahead. Although Van Duzen County Park is off the beaten path, it’s well worth the visit. The park is known for Swimmers Delight, an excellent place to wade or swim on a hot summer day. At this spot, the water has carved out a steep sandstone bluff on one side of the river. On the other side, the water washes onto a flat, pebbly beach. The river is wide, gently flowing, and wildly picturesque — it’s the kind of place where childhood memories are made. For more great spots to take a dip, read “Make a Big Splash Among the Big Trees” on our Giant Thoughts blog. Joaquin Miller Park Kiosks get an update! The League recently worked with the City of Oakland to install new interpretive content and maps in the kiosks, so park visitors can learn more about the natural area they are visiting.